Many times when we think of yellow it means the old blue and yellow combination, or yellow and red,or even yellow gingham. So, we pass over this wonderful color that brings sunshine into our lives. Think dahlias, sunflowers, and lemon yellow, or even chartreuse. Nothing makes you smile more than having a little or a lot of the right shade of yellow in a room. Now that is is officially summer, below are very chic ways to incorporate this new shade of yellow into your home, even if just a bit. 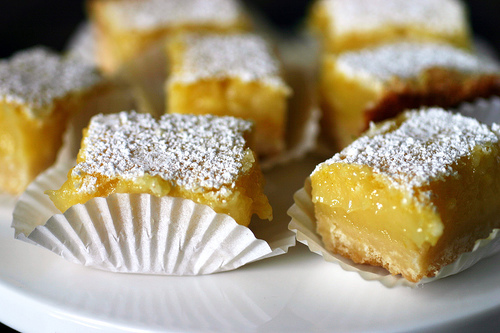 Also, I share with you my favorite lemon squares recipe, because what would summer be without lemons! I just love this fresh take on a modern white room. Just enough of the yellow to keep the room from being boring. Yellow lampshades are perfection. They remind me of my favorite pair of antique chinoiserie lamps that just pop in a room, even if they are the only yellow in the room. Need I say more.... Surround yourself with things that you love especially in your bedroom! 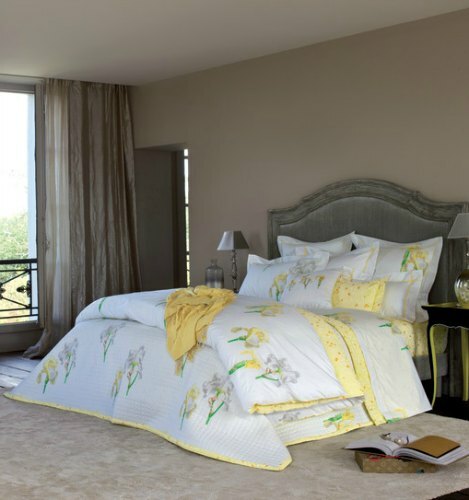 This Solstice pattern from Yves Delorme at first glance, just looks like a cutesy floral pattern. In this setting, the french designers master the art of bringing the garden into a sophisticated modern setting. Instead of looking too girly, it brings softness and happiness into this monochromatic, and otherwise quite boring grey bedroom. It seems as though aqua is the perfect accent color with yellow right now. The aqua gives the yellow a modern feel, but this room has a classic style also. Perfect for a bedroom with the simple white sheets and duvet. I just love the how the colors work together in this room. 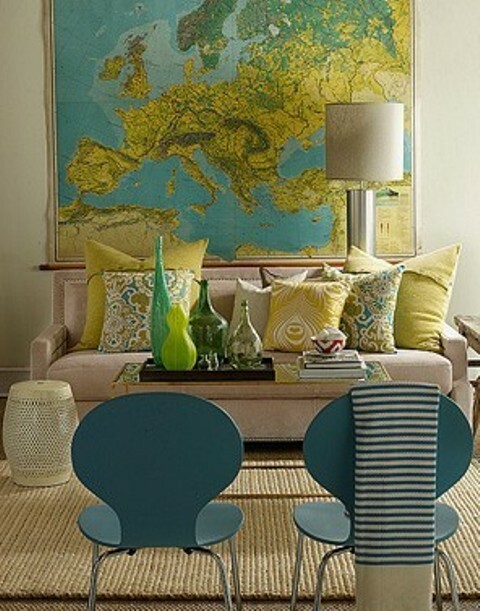 I love the large map hung above the sofa with the accent pillows that pull the wonderful colors into the room. Accessories of blown glass, stacked books, and modern aqua chairs are perfect combinations of color in this living space. Cheerful , colorful, and just plain fun, this reading nook just makes me smile! 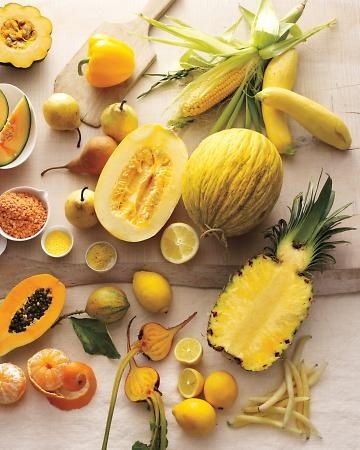 It's summer, and what better a time to introduce all the wonderful yellow produce into your repertoire! Containing beta-carotene, zeaxanthin, flavonoids, lycopene, potassium, and vitamin C. These nutrients reduce age-related macula degeneration and the risk of prostate cancer, lower LDL cholesterol and blood pressure, promote collagen formation and healthy joints, fight harmful free radicals, encourage alkaline balance, and work with magnesium and calcium to build healthy bones. What wonderful colors in this small space that I can imagine is great for reading, research, or home office. Unique color of aqua is introduced on the built-in bookcases, and makes this room trés chic. Who can resist these delectable sweet and tart bars after a summer meal! "Room For Inspiration" Receive our weekly blog posts in your inbox! Copyright Belle Chambre. All right reserved. Powered by Blogger.